Offered in 100% Polyester Cool-Dri Performance in Safety Orange. This awesome new shirt resembles our mafia and world speed record designs, but with a more understated twist. It has 4 areas of silkscreen art and logos. 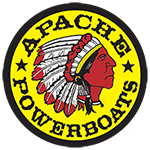 Apache Powerboats logo located on your front left pectoral, art design in the center of back, Apache Powerboats lettering on your left sleeve and Mark McManus’ signature on your right sleeve. *Your Cool-Dri performance shirt is 100% polyester in Safety Orange.